Having led the organization since June 2017, Dennis Moynihan is stepping down as Executive Director of BTVIgnite. Building on Burlington’s world class fiber infrastructure, BTVIgnite is a non-profit organization sponsored by leading academic, business, and government stakeholders that helps enable Burlington’s world-class tech infrastructure to support its growing digital and tech sector. Dennis had great success as the Executive Director of BTVIgnite, not only with an outstanding Innovation Week attracting new investors to the community and connecting local entrepreneurs with potential mentors and funders, but also in running a new accelerator program and supporting the advancement of the Vermont Innovation Commons. The Vermont Innovation Commons is an ambitious and thoughtful project affiliated with Vermont Works Management Co. that seeks to create substantial new innovation space within the Cambrian Rise development project. Vermont Innovation Commons will help make Burlington a destination for talented social impact entrepreneurs and companies. Dennis’ success in supporting Vermont Innovation Commons is an outstanding opportunity for him to help develop programming supporting entrepreneurs in Burlington and Vermont. We wish him great success with this critical project. Dennis’ leadership and input, and the perspectives of the Burlington’s academic institutions, private sector, and public sector interests represented on the BTVIgnite Board, have helped sharpen the focus for BTVIgnite’s efforts over the next six to 12 months as it continues its mission to support business development, innovation, and entrepreneurship in Burlington and surrounding communities. In lieu of an Executive Director, the Board intends to use its resources to augment existing capacity within the community to advance the goals outlined below, and will consider an Association Management Agreement with the Lake Champlain Chamber of Commerce for one year at its March meeting.  Enhance the current marketing effort to tell the story of Burlington’s success and attract talent and innovative companies: Burlington has outstanding home-grown companies, start-ups with enormous potential, and powerful entrepreneurial support organizations. The major institutions in the community should help trumpet these successes and lend their effort in attracting and retaining people and resources through a coordinated marketing effort that BTVIgnite is uniquely placed to organize and lead. The Chamber is already heading up a well-resourced new marketing initiative that can amplify the message of BTVIgnite.  Augment ongoing Smart City successes and leverage partners and networks to attract vendor and local interest in Burlington’s efforts: Supporting ongoing and developing new, tangible smart city innovations could both improve services for City residents and support a broader marketing effort. BTVIgnite is well placed to help bring in new partners and vendors to support such projects. The Chamber’s project management capacity and prior success in this role contributed to the Board’s desire to seek an Association Management Agreement to advance this goal.  Continue the success of Innovation Week: Connect our community’s entrepreneurs across with investors and mentors and help the entrepreneurial support network in Burlington continue to grow and access new resources to support a thriving tech sector.  Grow the organization’s role as a convener: BTVIgnite provides a unique forum for the City’s institutions to grapple with the opportunities and challenges posed by a 21st Century economy. The organization expects to expand its Board to additional members over the course of the coming year. Burlington’s natural resources or current successes make it an incredible place to live. BTVIgnite’s continued role as a convener of the major institutional players to intentionally support the development of the community’s next generation of successful innovators and businesses will help the city flourish in the years to come. Two projects to create digital solution for delivering education have been selected to receive grants of $10,000 each as part of the 2018 BTV Ignite Reverse Pitch Competition. 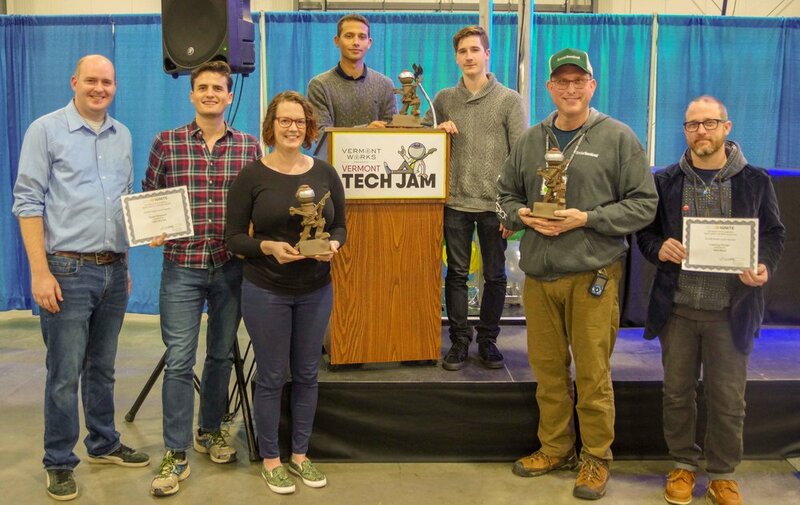 Announced as part of the 2018 BTV Ignite Innovation Week event TechJam, “Code Shepherd” and “Learning Portals” both offer the promise to bring 21st century technology to Vermont’s classrooms. "Code Shepherd" is a teaching platform to bring subject matter experts, teachers and students together in a collaborative code editor with a live video chat. Allowing for access to remote expertise, schools will no longer have to limit the classes they offer based on staff expertise. The team developing Code Shepherd includes Adam Burnett, Corey Andalora, Ben Corneau, Dave Davis, and Evan Gould. “Learning Portals” uses augmented and virtual reality technologies to let leaners join classrooms and other experiences remotely. This technology can help students who, for example, can’t attend class due to extended illnesses. The team behind Learning Portals includes Jake Blend, Rachel Hooper, Peter Moore, working with the Generator Makerspace and additional lab members, graduates and seniors from Champlain College. With grants of $10,000, each team is expected to further develop their solution and take it towards implementation with Vermont educational partners. These grants are made available through the generous support of US Ignite, Burlington Telecom, and the Vermont Agency of Commerce and Community Development. The 2018 Reverse Pitch Competition is part of BTV Ignite’s commitment to supporting innovation, entrepreneurship, skills development and STEM education. Five great ideas for "delivering education" awarded Reverse Pitch grants! The BTV Ignite 2018 Reverse Pitch competition has awarded five "Idea Grants" for proposed digital solutions to help deliver education. Each selected proposal receives $2,000 to help take their idea forward as a "proof of concept". In October, the two best solution demonstrations will be eligible for final grants of up to $10,000 each. The Idea Grant proposals were judged on the basis of their innovation, value for delivering education, use of high bandwidth internet, and potential for real world implementation. "Code Shepherd" (submitted by Adam Burnett): A teaching platform to bring subject matter experts, teachers and students together in a collaborative code editor with a live video chat. Schools will no longer have to limit the classes they offer based on staff expertise. "OpenWords" (submitted by Marc Bogonovich): A sustainable, open source model for deploying affordable language learning technology in rural areas. "Greenlight" (submitted by Scott Thibault): A connected collaboration platform focused on delivering the most natural life-like interface possible for communication at a distance. The key is an always on, always ready device that lowers the barrier to communication and fosters those spontaneous conversations that typically don’t occur when people are not physically collocated. "FlashcARds" (submitted by Jake Blend): Augmented Reality flashcards for students and educators, which when viewed through the application, will display relevant information, animations, solutions, wayfinding and more. "Learning Portals" (submitted by Jake Blend): Portals floating in AR/VR space that provide access to remote classrooms, locations, and even the past using 360 cameras and high speed internet. Doorways to new experiences will always be within reach, and provide a new pathway to education delivery. "As I watched the Reverse Pitch presentations, I was drawn into the creative aspect of developing solutions for the challenges faced by these leaders in technology and education. By combining the perpetual innovation of Generator's new Mixed Reality Lab with the incredible speeds of Burlington Telecom's gigabit infrastructure, we have the opportunity to explore emerging methods of learning in am ideal testing environment. Our team is looking forward to working with the support of BTV ignite create practical demonstrations of these tools." We congratulate these winning teams and thank all the applicants for their great proposals! Burlington, VT (April 6, 2018) – BTV Ignite will participate in this year's US Ignite series of "Reverse Pitch" Competitions. Digital solution developers and educators are invited to compete for cash grants to demonstrate innovative ways high-bandwidth ideas can help deliver education - in Burlington, across our state, and by linking our students with national communities and resources. $30,000 in total grant funding will be made available through this program, in awards for best solution ideas and, subsequently, for best proof-of-concept developed “application solutions”. An “application solution” can be any combination of software, equipment, digital systems, and related “services” that demonstrate new ways of delivering education. Anyone can participate, from individuals to companies and teams. And, everyone is encouraged to attend the launch event and subsequent events – there’s no requirement to participate in proposal developments. Anyone interested in creative ideas for delivering education is welcomed! We hope technologists and educators consider teaming up to share their respective skills. The Competition will be launched at an event on May 4 at 4pm, hosted at the University of Vermont Larner College of Medicine. Senior representatives from Microsoft will keynote our session, sharing insights on how new technologies are creating 21st century opportunities. We will also be joined by John Downes and Kieran Killeen of the UVM Tarrant Institute for Innovation in Education, Lea Ann Smith of the Essex STEM Academy, Ann DeMarle of the Champlain College Emergent Media Center, Michael Stone of the Chattanooga-based Public Education Foundation, and Scott Turnbull of US Ignite. The launch event will be livestreamed and recorded -- we hope educators and developers from across the state will join us online if they can't attend the event in person. More info on livestream links will be provided as the event approaches (please RSVP if you'd like to be contacted with more information). In a “Reverse Pitch” proposers, such as community leaders and local businesses, “pitch” a problem to local entrepreneurs, hackers, makers, developers, and others with an interest in new ideas. Participants are challenged to develop innovative solutions to these problems, including gigabit application ideas. Reverse Pitches provide community entrepreneurs and developers the opportunity to collaborate on groundbreaking work that fosters the development of next-generation gigabit applications to impact areas of national priority and communities across the world. The theme of our Pitch call will be "Delivering Education". We are challenging participants to consider how 21st century technology can let educators re-imagine our classroom and other educational experiences. In addition to developers, we strongly welcome educators to participate and share their vision. Specific activity suggestions will be provided as guidance, but the topic will be left broad enough to encourage participant creativity. We will guide participants to consider solutions that promote telepresence, augmented and virtual reality, platforms for connecting distributed educators, and partnership opportunities for working across multiple US Ignite cities (similar to the Chattanooga 4K microscope "gigabit" application). The Program begins with our launch event on May 4 where prospective participants and attendees will hear more about the challenge and how innovators are reimaging education. On (or about) June 1 we will host an “ideas pitch” session where participants will have the opportunity to share their solution concepts. The top 5 ideas, which include development plans, will receive a grant of $2,000 to support further development. We will work with participants – individuals and teams – through the summer to help them as they work on “proof of concept” demonstration solutions. In early fall (Sept/Oct), we will host a Reverse Pitch Finals event. The top two proof of concept applications presented will each be awarded $10,000 in grant money to further develop and, potentially, deploy their solution. To RSVP for this event, please visit https://www.btvignite.com/2018-reverse-pitch/ . For more information, please contact Dennis Moynihan at dennis@btvignite.com. A project led by the University of Vermont and the University of Tennessee Chattanooga is developing the ability to "see" underground pipes though augmented reality. The project has just appeared in Science360 News and more information is available at UVM Today. The ongoing research project, “Underground Infrastructure Sensing,” recently won a Smart 50 Award from a coalition that includes Smart Cities Connect, the Smart Cities Connect Foundation and US Ignite honoring the 50 “most transformative smart projects each year." 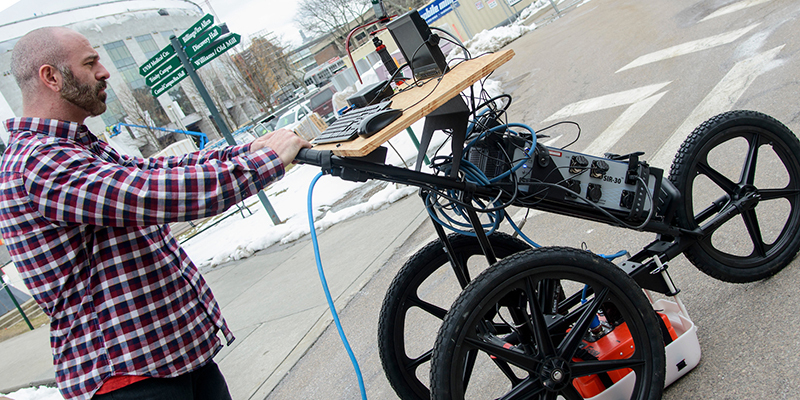 The technology, which is being supported by two National Science Foundation grants and one from U.S. Ignite, was showcased in a featured demo at the Smart Cities Connect national conference in Kansas City on March 29. BTV Ignite is working closely with UVM colleagues, including professor Dryver Huston, to promote and support this initiative. This project is just another example of Burlington and Vermont leveraging our strong research, digital, and community assets to drive innovation. BTV Ignite will help established “tech” startups find the investment, staff, and support they need to rapidly grow their business in Burlington and surrounding communities. This Growth Acceleration Program will provide expert level advising on business and financing strategy, advanced training on topics including sales and governance, and link companies with local resources to help them find the staffing, space, and resources they need to succeed. The program will be provided at no cost to companies accepted into the program nor will any equity share be required. In turn, companies will be asked to commit to building their business in Vermont. Burlington Mayor Miro Weinberger today announced that BTV Ignite is one of the four winners of the Mayor's Prize for Entrepreneurship. BTV Ignite has been awarded $50,000 to fund a new initiative, the BTV Ignite Growth Acceleration Program, that will focus on providing high-quality independent specialized advisory and development support to “growth stage” companies with a digital or technology focus. The goal of the Mayor’s Prize is to foster the growth and development of entrepreneurship in the city and encourage outside-the-box thinking about how best to achieve this. The Mayor’s Prize is entirely funded by a grant from the Kansas City-based Ewing Marion Kauffman Foundation. Other winners today include the Center for Women and Enterprise, the Women’s Small Business Program, and Vermont Law School. We're very proud to be selected for this competitive award and excited to have this additional support as we promote entrepreneurship in Burlington. More information about the BTV Ignite Growth Acceleration Program will be released in the new future and we look forward to helping companies stay and grow in our community! BTV Ignite supporting "Remote Workers"
The "21st century digital economy" is seeing many changes in how, and where, people live and work. One trend on the rise is an increase in the number of "remote workers" -- people who live in one area but work elsewhere in the state, country, or the world. Tech companies often have distributed teams with developers, designers, and other staff working remotely. Increasingly, some companies are completely distributed with no central location and all staff working from locations of their choice. This trend isn't only for tech companies -- many employers in different sectors are much more open to staff working remotely in essential any role. Digital technology, from Skype to Slack, are facilitating high performing distributed teams. Remote work is a particularly attractive trend for Burlington and Vermont. Many workers are attracted to our area for the high quality of life. For those living in rural areas, remote work opens up the global employment marketplace for our high skilled individuals. Remote work can have challenges, however. Sometimes, individuals can feel disconnected. Also, it can be difficult to find valuable local resources, including co-work space, attractive meeting locations, etc. To help with these challenges and support remote workers more generally, BTV Ignite has created the Burlington Remote Work Meetup Group (https://www.meetup.com/Burlington-Remote-Work-Meetup/). With almost 100 new members in the first month, this group will let remote workers, and employers and others interested in remote work, meet others in the community, share best practice, and generate ideas to help us better support the remote work community in Vermont. The meetup group hosts meetings monthly. Just join the meetup group to see who is involved and stay up to date on future meetings. Burlington, VT – On June 21, as part of an annual international celebration called Make Music Day, musicians in Burlington, VT and Chattanooga, TN will jam using a high-performance videoconferencing technology that enables real-time, simultaneous, live musical collaboration across long distances. Launched in 1982 in France as the Fête de la Musique, Make Music Day is now held on the same day in more than 750 cities in 120 countries. For the second year in a row, Big Heavy World, in partnership with Burlington Telecom, Fletcher Free Library, Advance Music Center and sponsored by BTV Ignite, will connect with musicians at the Chattanooga Public Library via the LOLA System. LOLA, is the name for a LOw LAtency Audio Visual Streaming System that has been installed by BTV Ignite at the Fletcher Free Library. Far from “ordinary” videoconferencing, it uses specialized devices to give musicians, separated by great distance, the experience of performing together in the same room. LOLA runs on a special 100 gigabit Ethernet technology called Internet2 and was developed to enable collaborative live performances, master classes, and remote auditions in the performing arts. Co-hosted by Dennis Moynihan in VT and Kinnawa Kaitibi in TN, there will be rock and hip-hop collaborations featuring Girls Rock Vermont, Chattanooga Girls Rock, the Vermont hip-hop collective Cultural Chemistry, fronted by Scott Lavalla and Hip-Hop CHA. The June 21st event will take place at Fletcher Free Library from 6-8pm, is free, all ages, and open to the public. Make Music VT is sponsored in part by BTV Ignite and statewide by The NAMM Foundation. Information about performances around the Vermont can be found at bigheavyworld.com/makemusicvt.